turn to the Hibachi brazier story as an introduction.
. . . CLICK here for general Photos !
. 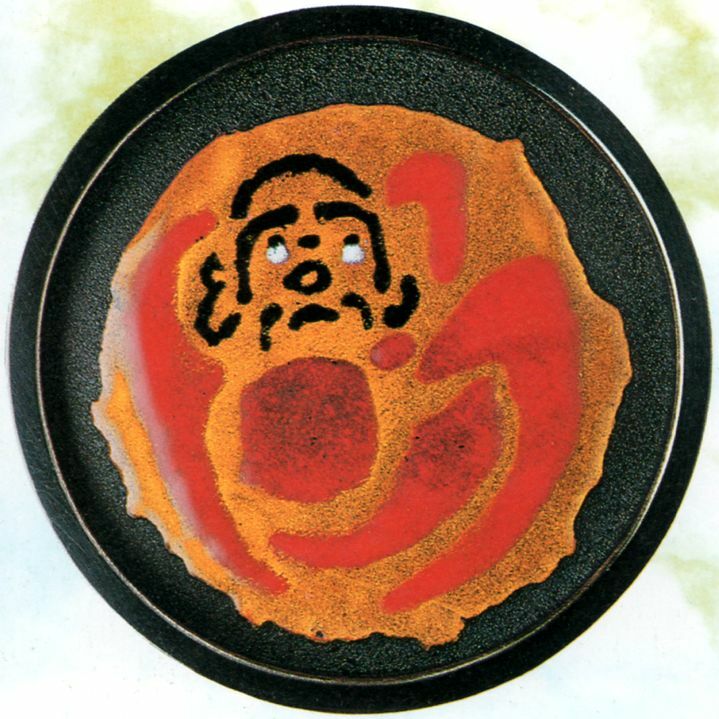 . . CLICK here for Daruma Teaburi Photos ! Te-aburi-type braziers are small portable fireplaces, which were originally transported from room to room and around them the family and guests could warm their hands and drink tea. 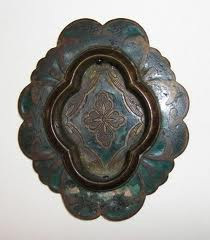 They were made from various materials, bronze, iron, procelain, earthware or wood lined with copper. The construction of Japanese houses was not ment to heat a room and living with nature was considered an integral part of daily life. Custom demanded that whenever a visitor arrived, the first act of hospitality would be to set a hibachi in front of him. 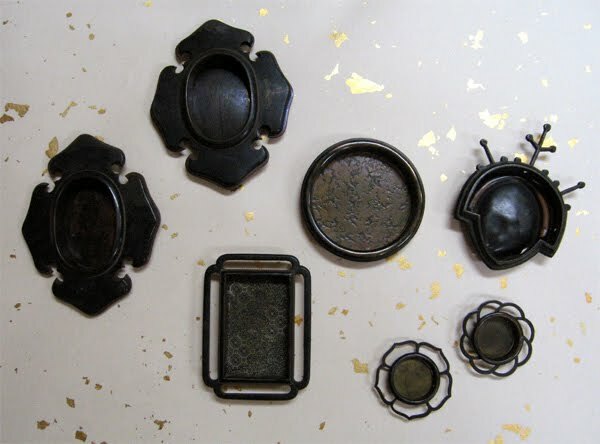 Ladies during the Heian period also used small te-aburi braziers to put some pieces of good smelling wood on the charcoal, place their garments over them for a while to scent the fabric before meeting with a special friend. Te-aburi were already used in the Yayoi Period. A gold lacquer Daimyo Te-aburi (handwarmer), the richly decorated lacquer stand of square form, set on four scrolling bracket feet decorated with scrolling foliage, the top with four aoi (hollyhock) mon, the Tokugawa family crest, amongst scrolling foliage and chrysanthemum flower heads. The four corners are decorated with applied metal fittings engraved with chrysanthemums and foliage, surmounted by a metal mesh fire cover with handle. This is a portable handwarmer that was used chiefly by women while traveling. This "Handwarmer for the Road" reminded me of a form of body warmer I have seen in the Kashmir area of India. You carry a little basket with a metal basin holding some hot coals in front of your belly. When sitting down you swing a big coat like a poncho around the body and use the little brazier as an inside warmer. In the yearly magazine Nr. 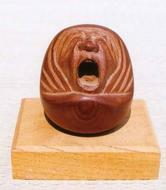 4 of the Daruma Association there is a description of a pair of this kind of Daruma Hibachi in the Castle of Iwakuni. They are made of Hagi pottery (Hagiyaki) and are about 30 cm high and of white color. 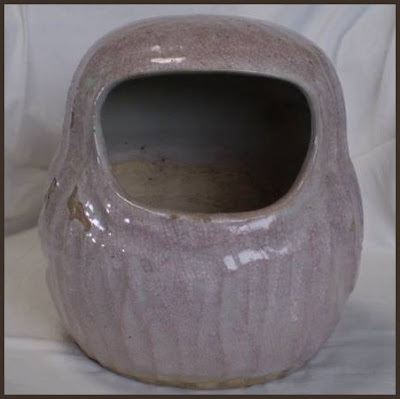 You can learn more about Hagi Pottery on this HP by Robert Yellin. Ca. 1880. Signed "Fujiwara" in katakibibori, the uneven engraving imitating brush strokes. The expressive face of Daruma is beautifully rendered in great depth and detail, and the suggestion of his robes creates a fluidity of line which is superb. There is a round bronze plate at the base of the interior which is cast in relief with scrolling vines and flowers surrounding a family crest ("mon") representing a "karahana" or "China flower." This heavy cast bronze has a rich wonderful patina that comes with age. Its function, in addition to being a work of art, is as a hibachi, one of the small personal ones known as te-aburi that were handwarmers for use by one of two persons at most. These were created to appeal to the personal tastes of their owners. The attractiveness of bronze hibachi is linked to the thickness of the metal and the quality of the casting, both of which are outstanding in this example. 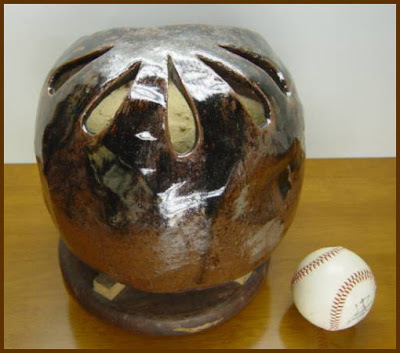 Dimensions: 10",high,7" diameter at top, 10" diameter at widest part. I will show you now some handwarmers of my collection. This is a sweet little Princess Daruma of white porcelain. The back is open to put in the hot coals on a layer of ashes. She comes decoradet with various patterns on her belly, some of this kind are also plain white. This one is 31 cm high and has a diameter of about 28 cm. A smaller sister also figures as ashtray. The next one is maybe of Izumo Pottery. His face is clearly modelled and the eyes are left open for the smoke to come out. So he has quite a sinister look on his face. He is 27 cm high and has a diameter of 28 cm. Here are two yawning Darumas in form of little handwarmers. They have a big open mouth to put in small pieces of charcoal and sometimes the inside is black with use. The traditional Japanese house is a wonderful construction to adapt to the needs of its inhabitants and the changes of climate. With the use of sliding doors the four little rooms of my old farmhouse change into a big hall to entertain a lot of guests; the bedding disappears in a shelf (oshi-ire 押し入れ) closed with sliding doors and between the windows and the living room there is a small veranda which can be shut off with "sliding doors to view the moon" (tsukimi shooji 月見障子). 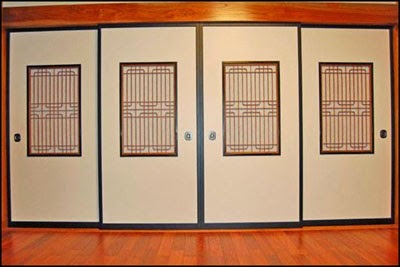 This is a special type of doors, made of a wooden frame coverd with Japanese paper and with a glass panel at the bottom. This panel is covered with a set of smaller sliding panels which are again covered with Japanese paper and can be moved up to let you look out of the window and enjoy the autumn moon while sitting on the floor sipping ricewine. In this ingenious way the room keeps warm, outside is cold and you still can enjoy the moon. The door type called "fusuma" is usually made of thick paper or wood panels. These large surfaces provide a superb canvas and gave rise to the most beautiful examples of the art of Japanese paintings. 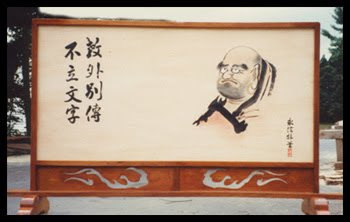 Pictures on Fusuma are also called "Pictures on movable walls" (shoohekiga 障壁画). Another name for fusuma is "Chinese Paper Sliding Door" (karakami shooji 唐紙障子). Fusuma are well adapted to the Japanese climate. When it is humid, they absorb moisture. On the other hand, when it is dry, they emit moisture to keep up a comfortable atmosphere. In ancient times, Buddhist subjects formed the nucleus of Japanese paintings, but by the early 8th century, secular objects began to appear. Paintings on walls, doors and screens existed in Japan since the Nara period, but they show a strong influence of Chinese art. Truly Japanese-style paintings (yamato-e 大和絵) with motives of flowers and birds of the four seasons, court scenes and landscapes appear during the Heian period. In Japan, art was an integral part of architecture, and painting was considered of primary importance in filling the large panels and movable walls of the numerous rooms in temples, shrines, castles and mansions of the nobles and warriors. In the late Muromachi period, the artist Kano Motonobu (Kanoo Motonobu 狩野元信1476-1559) introduced a combination of monochromatic Zen art with its strong ink brushstrokes with the more delicate lines, but vivid colors of the native Yamato-e. In the following Momoyama period his grandson, Kano Eitoku (Kanoo 狩野永徳1543-90) brought the style fo full frutition. 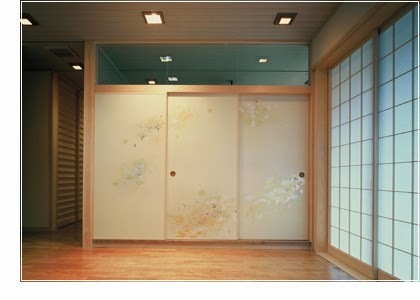 The sliding doors and screens of this era are mostly executed on a gold foil background and they are considered the golden age of Japanese painting. The most famous pictures on sliding doors are to be found in the great temples and mansions. The subject had to match the purpose of the room and the mood of the owner. 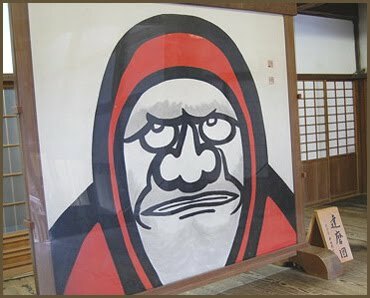 Therefore many temples feature a Daruma picture on the sliding door, but unfortunately I could not find them on the Internet. If someone can provide a quotation, please do so.
. Kano Kazunobu 狩野 一信 .
. Genji Monogatari　源氏物語 The Tale of Genji . The temple Ichijoo-In 一乗院 on Mt. Koya features with picutres of the Kanoo School (Kanoo-ha 狩野派). The Rinzai Zen-Temple Zuigan-ji in Matsushima close to Sendai. This long HP has many beautiful paintings. CLICK on the thumbnails for many more photos ! Finally, let us have a look at two of my sliding doors. "I was very sick a while ago and prayed a lot to get better. Now I am well again and full of gratitude. So I started to write the Heart Sutra and paint Daruma san, starting with small pictures and now doing large ones. Since you like Daruma san too, I give you some of my work for your new Daruma Hall!" They are paintings, but we had them mounted on the sliding doors to give them more space. There is one on each side of the partition. The Chinese characters on the one with the sutra read "Heart of Buddha" (busshin 佛心), the others are a famous Zen word from the Chinese Zen Master Wu-Men (Mumon 無門). "Every Day is a Good Day" (nichinichi kore koonichi 日々是好日).
. Every Day is a Good Day . In Zen you do not fret about things that are over and you do not worry about things to happen in the future. Just experience the moment, be it full of pleasure or full of sorrow, do not judge its quality but experience it to the fullest. Then every day will be a "Good Day", may it be rain or storm or sunshine. Here is a quotation to help you solve your Koan Problem. "When you are assigned a koan by your meditation instructor, such as, "What is the sound of one hand clapping?" 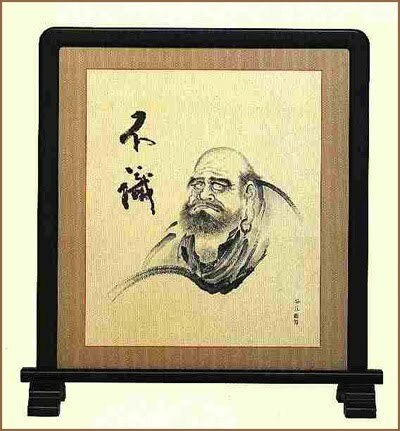 or "Why did Bodhidharma come from the west?" you have to ask yourself, "What does this have to do with my real suffering - my depression, my fear, or my anger?" If it does not have anything to do with these real problems, it may not be a path you need. It may be just an escape. Practice you koan in a way that your suffering is transformed". Lama Surya Das (1997) gained insight from his elderly Zen master about the use of the koan. The elderly master stated, "We all have to solve it in our own way; how we live our lives day by day and what we do depends ultimately on ourselves." Please continue to read the story about folding screens, Byobu, to learn more about art and Japanese homes. 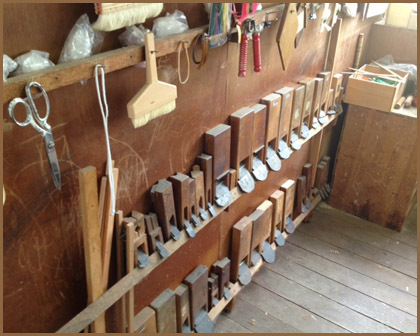 They make shōji 障子, ranma 欄間 and many wooden decorations for windows and partitions. kazatooshi 風通し（かざとおし）"letting the wind in"
kazatoori 風通り（かざとおり） "letting the wind pass through"
Especially in the machiya merchant homes of Kyoto the preparations for summer and winter were quite necessary to keept the rooms cool in summer. A brush that has been soaked in pigment is drawn across the paper. A single brush that includes color which has been gradated by water is drawn across the paper to create a shading effect. ③ Chojihiki 丁子引き (striped-pattern dyeing): A brush with bristles intermittently removed to achieve a comb-like effect is used to create choji (stripe) patterns on the surface of the paper. Although mica is sometimes applied simply when rubbed in by hand, in most cases pigment or gold/silver paint is applied in two layers. Following rubbing in by hand, the paper is stretched out and dosa どうさ (a protective "sizing" glaze) is applied to the surface. Mica 雲母（きら) and gofun 胡粉 (crushed seashells) are passed through a screen membrane onto a pattern-carved woodblock, and paper is then placed over the woodblock and rubbed gently. 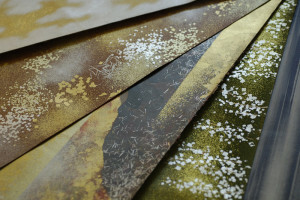 Gold/silver flakes are then sprinkled over the paper that has had paste applied to it, and after drying, the excess flakes are removed and a dosa glaze is applied to the surface of the paper. A special tube-shaped tool used for sprinkling flakes (a tube made of bamboo with strings stretched over the end), and a tool similar to chopsticks called hakuhashi 箔箸 are skillfully utilized to sprinkle gold /silver flakes over the surface of the paper. Flakes reduced to a fine powder are inserted into a special tube-shaped tool (a tube made of bamboo with a fine mesh of copper wires over the end). The powder is repeatedly sprinkled over the surface by shaking the tube. Gold/Silver paint is applied to one end of a brush, and then the brush is drawn across the paper lengthwise along a ruler with one side of the brush elevated. A pre-patterned woodblock is placed below washi (traditional Japanese paper) that has undergone the deibiki process. The painted portions of the paper are then rubbed from above using a boar's tusk. This causes the painted portions to physically rise up. 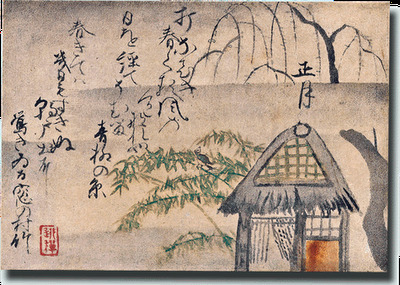 A traditional nihonga 日本画 (Japanese painting) or sumi-e 水墨画 (ink painting) is added for decorative effect. Pattern paper treated with astringent persimmon juice is placed on top of washi (traditional Japanese paper) and pigment and/or dye is used to print designs. A number of sheets of pattern paper treated with astringent persimmon juice (5 to 7 sheets) are used to print colors one at a time until the intended design is complete. Edo Karakami is patterned traditional Japanese paper that is affixed to fusuma sliding doors and folding screens, etc., for decorative purposes. Woodblock printing using pre-patterned blocks, Ise-Katagami 伊勢型紙 stencil printing, hikizome brush dyeing, hand-sprinkling of sunago decorative powders 砂子手蒔き, and a wide range of other techniques are employed when making Edo Karakami. Karakami patterned paper was introduced from China to Japan during the Heian Period (approx. 794-1185) and Japanese craftsmen subsequently imitated Chinese karakami using washi (traditional Japanese paper) as a base. Karakami was mainly produced early on in Kyoto as paper for writing waka (classical Japanese poetry). During Japan's medieval period, people began to use karakami for decorating fusuma, hanging scrolls and the like, and during the Edo Period (1603-1868) many karakami craftsmen in Edo began to make products that could be used in such decorative roles. In contrast to Kyo Karakami (Kyoto-style karakami 京からかみ), which focuses almost exclusively on woodblock printing, Edo Karakami is unique in its use of woodblock printing as a base along with print-type textile dyeing using patterned paper, brushwork and a variety of other techniques. Many Edo Karakami works in the past were free-spirited and stylish, reflecting the tastes of the samurai classes and townspeople. Although some works were damaged by war or fire, craftsmen restored them on each occasion. Thus, Edo Karakami continues to provide both color and a sense of repose in people's lives even today. Edo karakami paper is a government-designated traditional craft made by adding designs and decorations to washi, Japanese handmade paper. As the name implies, it was developed in Edo (today’s Tokyo), and reflects a townspeople’s culture established by craftsmen and merchants who worked in the city during the Edo Period (1603-1868). The craft features free and fluid designs, many depicting familiar objects and scenes from daily life at the time, as well as natural subjects that give a rich sense of the seasons. The origins of Edo karakami can be traced back to the Heian Period (794-1185), when patterned mon-toshi paper was introduced from Tang dynasty China. This paper was used as a model for the first karakami paper, which was handmade using wooden blocks engraved with designs and decorative materials such as mica powder or gofun, a whitewash made from ground shells. At first, this paper was used as eiso – paper for transcribing poetry, such as short tanka poems or haikai linked verse – but as time passed, its use spread to wallpaper, byobu room partitions, fusuma heavy sliding doors and shoji, traditional light-weight sliding doors with translucent paper screens. As the city of Edo grew under the Tokugawa government, both demand and uses for karakami paper expanded. 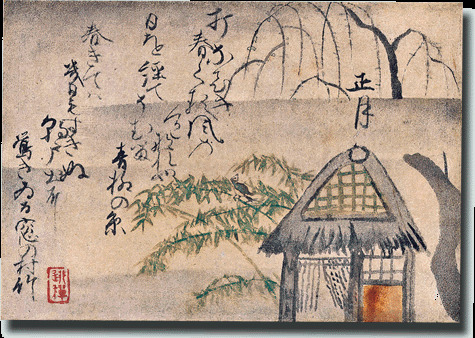 As need for the paper increased, the various decorating techniques and designs of Edo karakami came into being, developing into the unique and original forms that came to distinguish the art. There are two key traditions of Edo karakami decoration, each building off an ancient style. 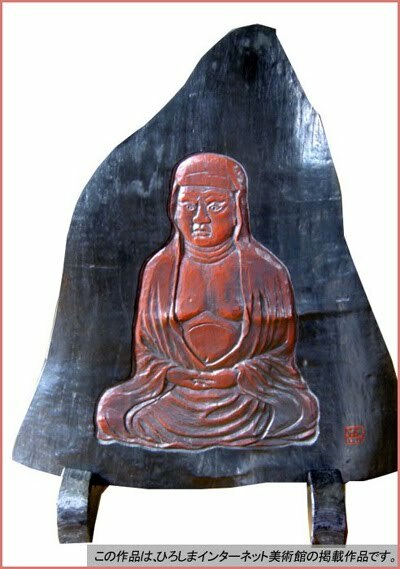 One is a technique that embellishes works such as Buddhist scriptures with gold and silver powders, used since the Nara (710-794) and Heian Periods (794-1185). 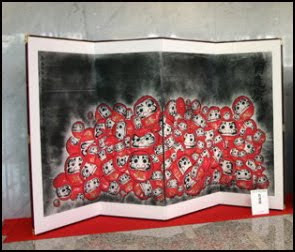 The masterpiece of this style is known as the Heike Nokyo, a series of 33 Buddhist scrolls dedicated to Hiroshima’s Itsukushima Shrine in the hope of bringing prosperity to the Heike clan. 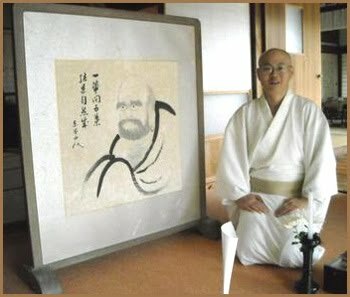 The other technique is that of ryoshi writing paper decoration, which centers around a wooden karakami block that adds decorations to eiso paper. Its masterpiece is said to be the Nishi-Honganji Collection of Thirty-six Anthologies (Nishi-Honganji-bon Sanju-rokunin-kashu), a collection of the work of 36 waka poets assembled at the end of the Heian Period . Today, the traditional decoration techniques of Edo karakami are still passed on even as they continue to evolve. There are many galleries that display this traditional craft in Tokyo, offering plentiful opportunities to examine its beautiful forms firsthand. exterior sliding door, to keep out the cold and rain and protect the glass windows during a typhoon. They are traditionally made out of wood and pulled back during the daytime in a special box at the side of the house. When in place at night they have a special lock at the inside to keep burglars from opening them. Modern plastic versions with insulation are also available. They can be made from simple wood or highly decorated metal. These hikite can be works of art in themselves.
. Sliding Doors with Dragon paintings .
. Kaneda Sekijo 金田石城　. The context of Japanese interior was already covered in the story about sliding doors, Fusuma, so please refer to this before reading on. 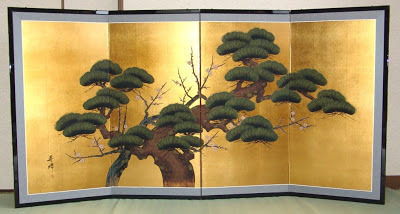 The golden age for folding screens and paravents was the Momoyama and Muromachi period. Together with the sliding door paintings they were the best medium to lavishly decorate a room and also to give expression to the painters individual taste. A folding screen set usually consists of two screens with six panels each and thus provided a large canvas, sometimes covered completely with gold foil. Chinese (too-e 唐絵) and Japanese motives (yamato-e 大和絵) where the two mainstreams of this extremely rich genre. The word BYOOBU (byobu) originally means "Protection from the wind", so they were used to ward off drafts, but generally they were movabel walls used to partition a room for ceremonial or other occasions. The first screens were introduced from China and Korea, but soon became a thouroughly Japanese part of the interior and sometimes they were even used as presents by the Japanese envoys to the Chinese court. The earliest screens were painted on separate panels and then hinged with leather or cloth pulled through holes at the edge of the wooden frames. The oldest screens in Japan are kept in the imperial treasurehouse Shoosooin (Shosoin 正倉院) on the grounds of the temple Todai-ji in Nara and date from around 750 A.D. They consist of paintings on paper and silk and panels of woven fabric. While almost all early Japanese art was centered around Buddhism, the subject matter of the screens is uniquely secular and includes palast scenes, landscapes, poetry, natural themes such as animals, birds, flowers and grass or human figures. 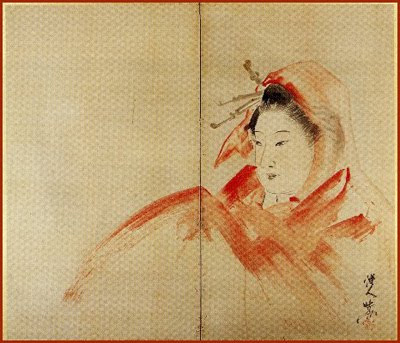 A new Korean technique introduced in the mid-fourteenth century hinged the screen panels together with paper and offered more continuous surface on which to paint. This opportunity for new formats and changes in composition eventually brought the art of Japanes screen paintings to its zenith. The introduction of firearms to Japan by the Portugese in the mid sixteenth century revolutionized warfare and with it, architecture, ushering in a golden age of screen painting during the Momoyama period. The monumental (and drafty) castles made necessary by the use of guns, where perfect for large, lavishly decorated screens. The liberal use of gold backgrounds not only symbolized the strenght and wealth of the new warlords but, more practically, served to reflect light and illuminate the vast, gloomy interiors. each with a special seasonal aspect, coming usually from waka poetry. by Tawaraya Sotatsu (?-1640) from the famous old Zen temple Kennin-ji. depicting some hermits, but with bold strokes and in vivid colors, in contrast to the hermits we will meet a little later. The famous screens by Ishida Yutei (Ishida Yuutei (1721-1786), featuring a group of herons on a golden background. Golden screens are quite popular these days. 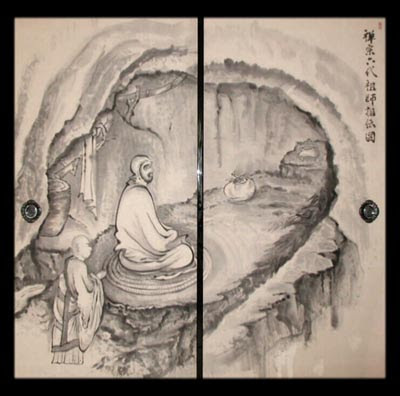 The following folding screen brings us back to the subject of Zen. 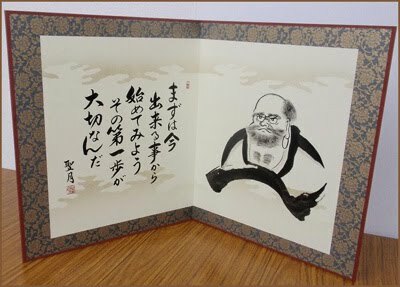 by Kaiho Yusho (Kaihoo Yuushoo 1533-1615) are close to the Zen way of life. During a trip to Nishi-Izu in 1991 I found a small temple, Hongan-ji near Dogashima, with a somehow homemade screen wiht a picture of Daruma san. 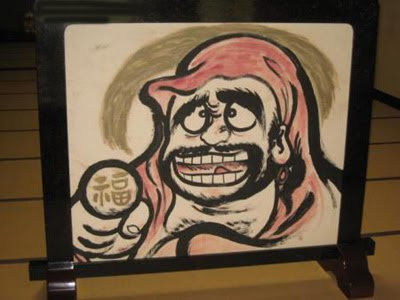 It shows Daruma below the inscription "Every Day is a Good Day", which we already saw in the story about Fusuma. In the entrance of the Daruma temple Hoorin-ji in Kyoto I found these two items, a folding screen with two panels and simple screen. 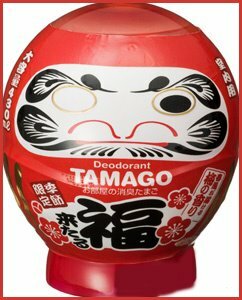 The big Daruma face has a real hooked nose like an Indian monk.
. Kigo for Winter . Written in Genroku 2 元禄2年. 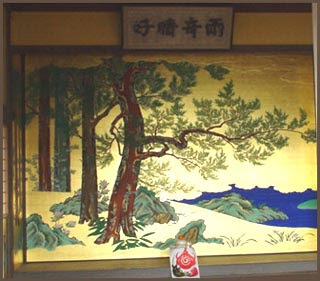 Greeting hokku for his disciple Hiranaka 平仲 in Iga, who had a splendid folding screen in his home. Basho later revised the poem to the GOLDEN SCREEN, above. gauze clothes are painted-- whose? usumono, ra 羅 thin robes, is a kigo for summer. Golden screens were used as a formal decoration. 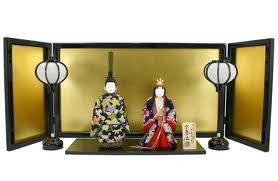 In small format also for the Hina Doll decoration and other decorations. On the same day Buson also wrote a haiku about fish dried on the beach in the autumn wind. This is a standing screen consisting of a single panel supported on two feet. 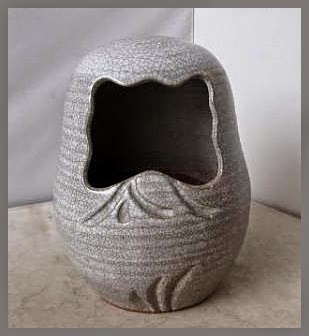 It is used to seperate off a corner of a room or placed in front of an open doorway to gain a little privacy or block a direct breeze. Sometimes it contains of a simple large piece of beautiful wood and stands in the entrance of a mansion or hotel to prevent the full view of the lobby. 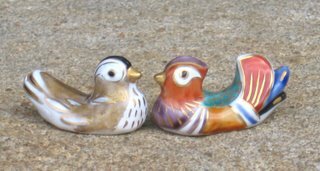 12 twelfth month, early plum soubai 早梅 and mandarin ducks mizutori 水鳥.
. kai byoobu 貝屏風 folding screen with sea shells . Air freshener for your home ! One in a line of TAMAGO Eggs which produce an air cleaner effect for about 1 or 2 months. They come in different fragrance for the season.